One of my more well-received recent tweets suggested an idea for a new horror movie: Celluloid Sematary. It’s a place where they bury bad films, only to have them come back as even worse remakes. Although by now, the “sematary” would undoubtedly be bursting at the seams with film mediocrities, there’s no doubt which one would be its centerpiece. That honor would have to go to its namesake, the current remake of Stephen King’s Pet Sematary, a completely unnecessary and unremarkable remake of a relatively unremarkable original. On a happier note, Louis does make friends with his only living neighbor, widower Jud Crandall (John Lithgow). Jud befriends Louis’ nine-year-old daughter Ellie (Jete Laurence). When Ellie’s beloved cat Church dies, and Louis goes to bury Church in the pet sematary, Jud talks him into going deeper into the woods, past a natural barrier, to bury the cat instead. Soon afterward, Church reappears, looking much the worse for wear, and with a nasty temper to boot. Eventually, Jud tells Louis that the area where they buried Louis was an ancient Indian burial ground that had been cursed, and that bodies buried there would come back to life. But, as Jud had learned decades earlier when he reburied his own pet dog, they were not the same. That last sentence, which highlights a truism that every horror movie fan knows, even if they are unfamiliar with any version of Pet Sematary, is at the heart of the King novel. Various characters keep burying people or animals in the cursed burial ground, even though they know full well what is going to happen. They do so because they are so grief-stricken that they are willing to risk the overwhelming likelihood of what’s going to happen. That’s especially apparent in the final image from the book, which also occurred in the original film. The screenplay for the earlier version of the film was one of the few written by King himself (he also has a cameo as the minister at a funeral), so it’s not surprising that he captured the essence of his novel in that finish. Of course, King can’t be blamed for the overwhelming mediocrity of the rest of the movie. 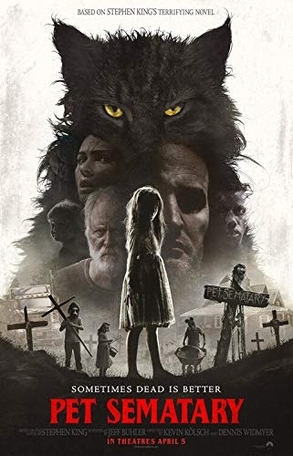 In the new version of Pet Sematary, directors Kevin Kolsch and Dennis Widmyer merely pay lip service to the concept of overwhelming grief as a motivation for the poor decisions in the movie. Instead, Jud and Louis rebury bodies for the most basic of horror movie reasons, namely, because, if they hadn’t done so, then there wouldn’t be a second half of the movie. Indeed, that last half of the film is where the directors pack most of the creepy moments in the new Pet Sematary. But all of those frights turn out to be just variations on the familiar scary movie theme of the bad seed. Ellie may be demonically possessed, but she follows the same script that horror movie youngsters have since the days of Patty McCormack in the original Bad Seed. In that regard, having Ellie as the reanimated child is a good move on the filmmakers’ part, since an actress playing a nine-year-old is capable of displaying a greater emotional range, including maliciousness and deception, than a toddler could. The best sequence in the movie occurs when Ellie turns on Rachel when the latter arrives to see what her husband has done. The scene is creepy and shocking, achieving some of the few moments of horror in the film. For the most part, however, most of the rest of the attempts at horror wind up being more bizarre than anything else. The initial attempt at horror, showing children wearing animal masks as they go to the pet sematary seems almost silly, as are some of the scenes between Louis and Ellie. Jason Clarke, never the most emotional actor around, can’t seem to find the right degree of intensity. The only actor who really distinguishes himself is John Lithgow. The script reduces his character from a surrogate father for Louis to merely a source for whatever exposition is needed to advance the movie. But instead of just being a dry, talking information dump, Lithgow says his lines as if he were telling ghost stories around a campfire. It’s overacting like crazy, but it also provides Pet Sematary with a badly needed energy boost. 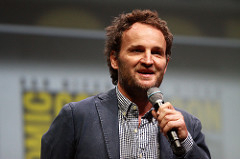 In this clip, Jason Clarke reintroduces his dead daughter to Amy Seimetz.